This was the 2nd assignment for Alfred Hitchcock’s Mystery Magazine (I was much happier with how this one turned out than with the first one). The original artwork has long since disappeared, and this is a scan from a printed page of the publication. This has been recently unearthed after having not seen it in over twenty years thanks to a Mr. Bruce Harris from New Jersey, who has been kind enough to send me some clippings of some of my early work for this magazine. 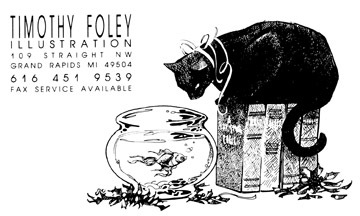 Here are some more black and white postcards that I sent out that first year in business. 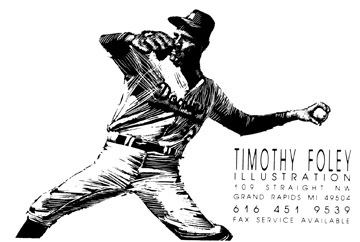 If I remember correctly, I usually had these printed up 4 to a page and sent them out every other week, as a way of bombarding potential clients. 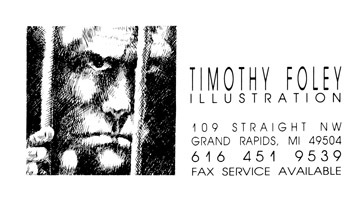 By November of ’89, I had a couple clients who were starting to use me on a regular basis, and I started doing a bit of work for a local department store, designing artwork for their newspaper ads (Steketees, which is now no longer in business). Aside from Alfred Hitchcock’s Mystery Magazine, though, the client list was still primarily Grand Rapids based. This would change beginning on nearly the last day of the year. To the left, our little ‘bundle of joy’ who arrived around 6:30 on a drizzly Sunday night, after a very quick delivery. 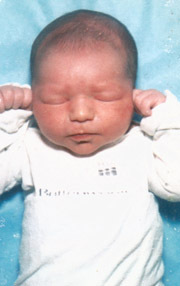 Keenan Patrick Foley. A lot of diapers were changed in this first year of business. As I’m writing this (2008), he is now in his final year of high school, and planning on attending Columbia College in Chicago in the fall. UPDATE (2010): Went to Columbia College in the fall of 2008, and he is now halfway through his junior year. Studying Jazz Saxophone performance as a music major, with the possibility of also going into some sort of writing/English in graduate school. A good looking kid, taller than his old man (and much smarter). UPDATE (2018): The boy is now in his 28th year, and will be getting married to Lydia Shepard in August of this year in Chicago. He works as a leasing agent and just passed his realtor exams, and still plays in various jazz groups in the Chicago area. ANOTHER (2018) UPDATE: The wedding was beautiful. Here’s wishing Keenan and Lydia a happy life together. Here’s a photo of me and the boy in the hotel room getting on our fancy duds for the ceremony.